When you visit Echeverri Dental Center, our friendly dental team will provide gentle, compassionate dental care to meet all your oral needs. We are a family-owned and patient-focused practice, and we keep our attention on you, making sure that you are comfortable, and providing dentistry for your entire family. We welcome you to contact us at 713-956-8767 to make your appointment with one of our talented general or pediatric dentists and learn more about dental care in Houston, Texas, and surrounding areas. We look forward to meeting you! 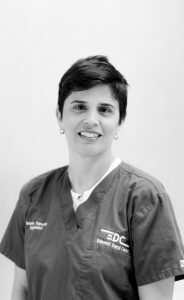 Melanie has been with our practice for 15 years. She attended the University of Texas, where she graduated with her degree in 2001. She strives to provide quality care for our patients, connecting and developing relationships that keep our patients coming back to our office. She loves working with patients of all ages and caring for entire families. Melanie enjoys being a mom, mountain biking, and triathlons. 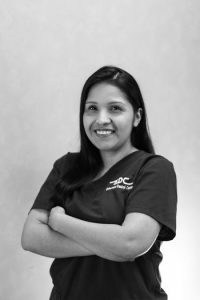 Cristina has been a registered dental assistant for 6 years, and joined our team at Echeverri Dental Center 2 years ago. Cristina attended Remington College, where she graduated in 2011. She is certified in nitrous oxide and pit fissure sealant. 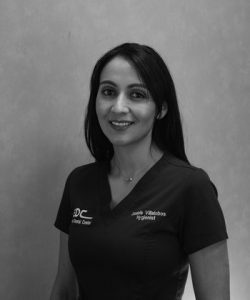 Cristina work closely with our hygienists to meet our practice goals. 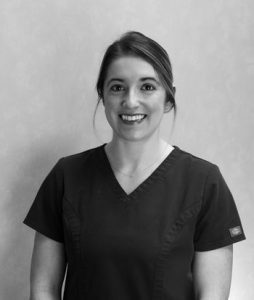 Her favorite part of our practice is the opportunity to educate patients about their oral hygiene and help them work towards a healthy smile. Cristina most enjoys spending time with her two boys – Ivan (age 12) and Jesus (age 10). Wendy became part of our team 2 years ago, after graduating from the College of Health Care Professions in 2015. She loves helping patients with their dental education and oral health so that they can work toward a healthy smile. She has 2 children, Jaydenn (5) and Jayleen (4 months). When not at work, Wendy enjoys spending time with her family. 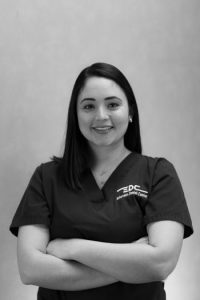 Daniela joined our team in 2018, she graduated from Pima Medical Institute with an associate degree of applied sciences in Dental hygiene. 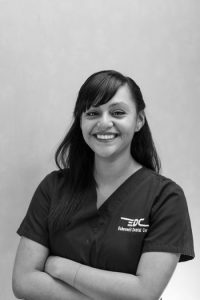 Daniela ‘s passion in dentistry is educating patients on proper dental hygiene procedures and techniques to maintain optimal oral health. When she is not at work, she enjoys working out and spending time with family and friends. 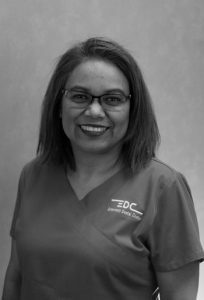 Dezare joined our dental family 3 years ago, and brings with her a dedicated, hardworking attitude and commitment to our patients. She enjoys meeting new people, helping to build our patients confidence, and seeing our patients smile after their treatment. 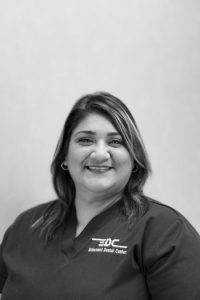 Maria began working at Echeverri Dental Center in 2002, following her graduation from Astrodome Career Center in Houston, Texas. 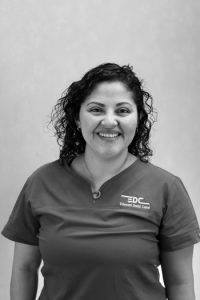 She helps train our new team members, and enjoys practicing dentistry on our patients and working to help them improve their dental health and smile.Maria is the eldest of six girls. When not at work, she focuses on being a wife and mother, and enjoys spending time with her loved ones. Jennifer has been with our team for 7 years. 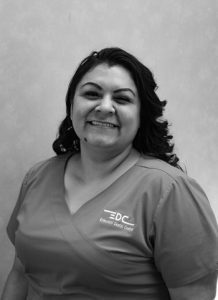 She is always here and ready to work, and enjoys sharing with our dental family and helping patients improve their smiles and confidence. Elizabeth has been part of our team for the last 5 months, and enjoys learning something new every day. She graduated high school in 2015 and dental assistant school in 2016. Elizabeth has wonderful parents, 32 older brothers, and an older sister. She also has 2 chihuahuas, Bella and Toro. In her spare time, Elizabeth likes to dance, learn new things, and spend time with her family and her puppies. 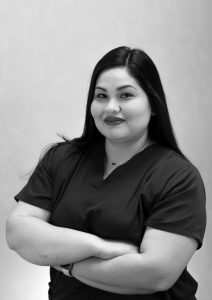 Gloria joined Echeverri Dental Center in August of 1998. She earned her dental assisting license in 2006, and is certified to provide sealants, and nitrous oxide. Gloria has also held Texas Children privileges for more than 10 years. 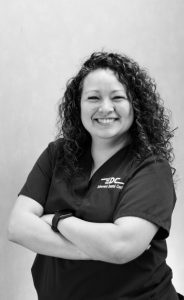 She works hard to provide the best care possible and a comfortable experience for our patients, and to provide them with a thorough dental education. 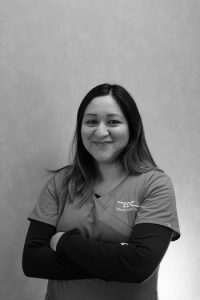 Gloria loves that our office can teach our patients about many different areas of dentistry, from pediatrics and hygiene to general dentistry and orthodontics. She also enjoys that we are family-oriented, and that we provide quality care to patients of all ages and to special needs patients, using the latest technologies to aid us. 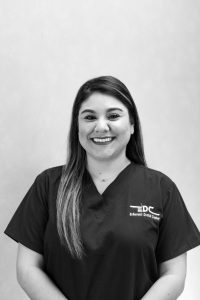 Gloria has a son who is currently attending college and Sul Ross State University, and a daughter who is also part of the Echeverri Dental Center team. Since 2008, Gloria has accompanied Dr. Elsa Echeverri on her Faith in Practice mission trips to Guatemala. This is one of her greatest experiences working at Echeverri Dental Center. 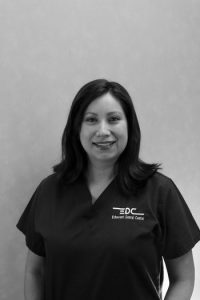 Elena has been with Echeverri Dental Center for 13 ½ years. She attended Spring Woods High School, and earned her dental assisting certificate from Astrodome Career Center. 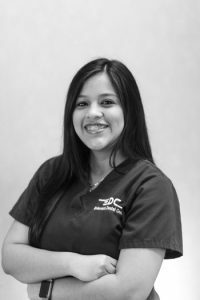 She continues learning about new things each day at our practice, and does her best to provide patients with education on their treatments and to help our dentists provide the best dental care possible for our patients. For Elena, the best part of our practice is that even with many years of experience working with children remains challenging, and she can use her experiences from her work with her own children at home. Outside of the office, Elena enjoys spending time with her family and traveling. 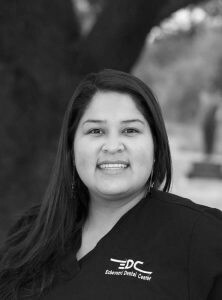 April has 16 years of experience in dentistry and has been a registered dental assistant since 2006. She is certified to provide nitrous oxide and sealants and is well-versed in all areas of dentistry. April can work independently when needed, allowing her to participate as part of any team with little to no instruction and take leadership roles when needed. Her favorite part of working for our practice is that she never stops learning new things and that we are a family-oriented office and provide a wide range of pediatric, general, and orthodontic services. April and her husband have been happily married since 2007, and have 2 fur babies. 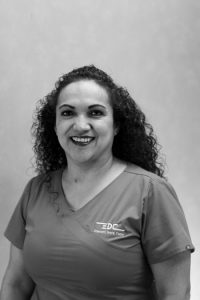 Alicia has been with Echeverri Dental Center for 20 years. 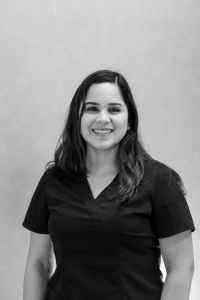 She loves helping our patients with their dental needs, and believes that the best way to contribute to our practice is to continue learning and applying that knowledge to benefit others. Ninfa has been with our team for 17 years. She likes being part of a family business, and is in our office helping and getting to know our patients every day. Florencia has been with our team for 15 years. She helps develop treatment plans for our patients, and communicates effectively with our administration to ensure that our patients enjoy a smooth and positive experience at our practice. Florencia always puts forth her best effort, and constantly searches for ways to improve the quality of her work. In her spare time, she enjoys exercising. 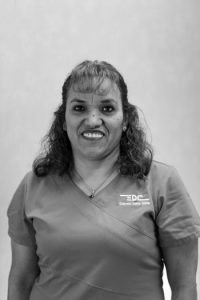 Nancy has been with Echeverri Dental Center for 15 years. She works hard to help our patients with their dental insurances, by recognizing interdependencies.